“The clients approached SAOTA to design a family holiday home that responded to the site, especially the views. They wanted a relaxing, yet elegant home that would be comfortable when entertaining many guests whilst also feeling intimate and cosy when it’s only one or two of them in the house,” said director and project leader Phillippe Fouché. Other factors that drove the conceptual organisation of the building were the views, sunlight, prevailing wind direction and the zoning parameters. This site is located to the South of Beacon Isle in Plettenberg Bay. The site slopes down to the beach and has uninterrupted views over the Indian Ocean, Robberg to the South East and the Outeniqua Mountains in the distance towards the North. The original contour plans revealed that this site was originally a dune with a higher mound towards the southern part of the site. The house was conceived as a simple box, floating over the dune, capturing and framing the view. The outer shell of the box is finished in a rough textured concrete, contrasting with the smooth reveal and soffit that tapers to create a delicate frame. 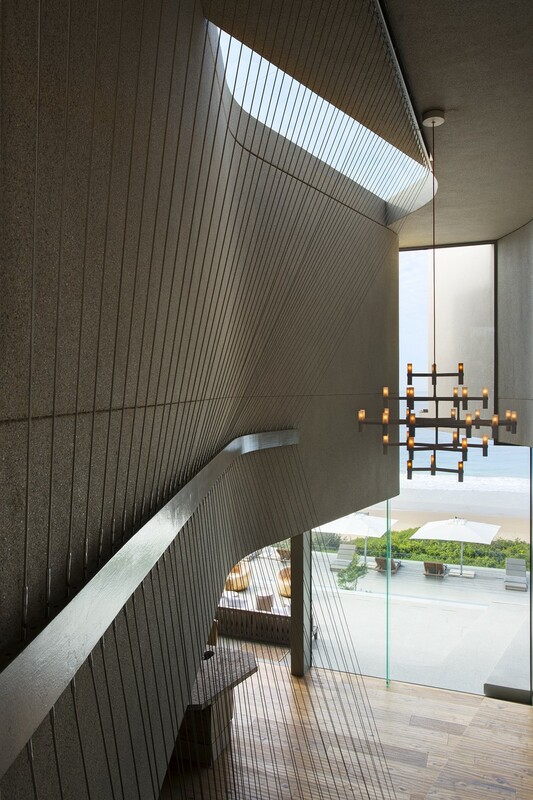 “From the beach, the building is expressed as a stone plinth, representing “earth”, with the bedroom spaces appearing to float over it,” noted Mias Claassens, architect at SAOTA and member of the project team. The upper bedroom wing is finished in a natural sand coating, a direct response to the original dune on the site. In order to exploit the maximum height allowed on the site, the southern part of upper level is higher and appears to be sliced off from the northern part in a sculptural way. This opening extends vertically through the building, washing northern light through the deeper spaces of the house. “Stairs are delicately suspended within this carved opening, also allowing views through it and lit from a skylight above. 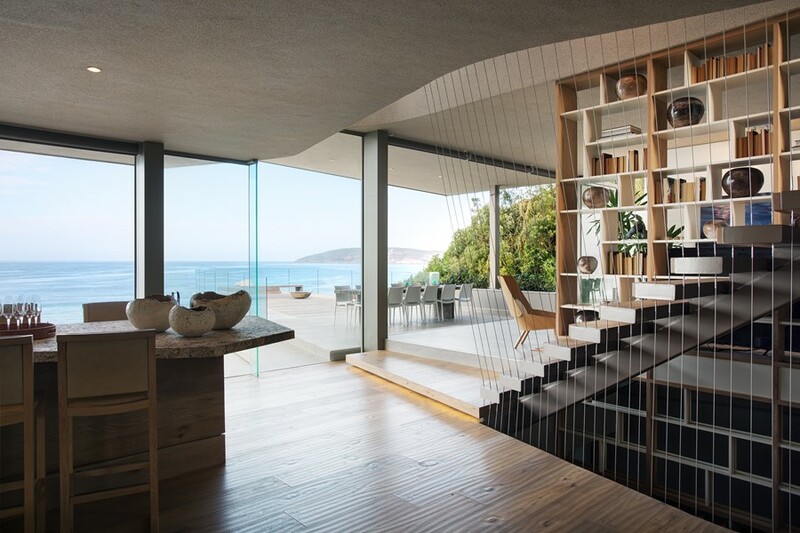 The geometry of the staircase continues as a diagonal line that extends the cantilevering entertainment terrace towards Robberg,” said Phillippe Fouché. 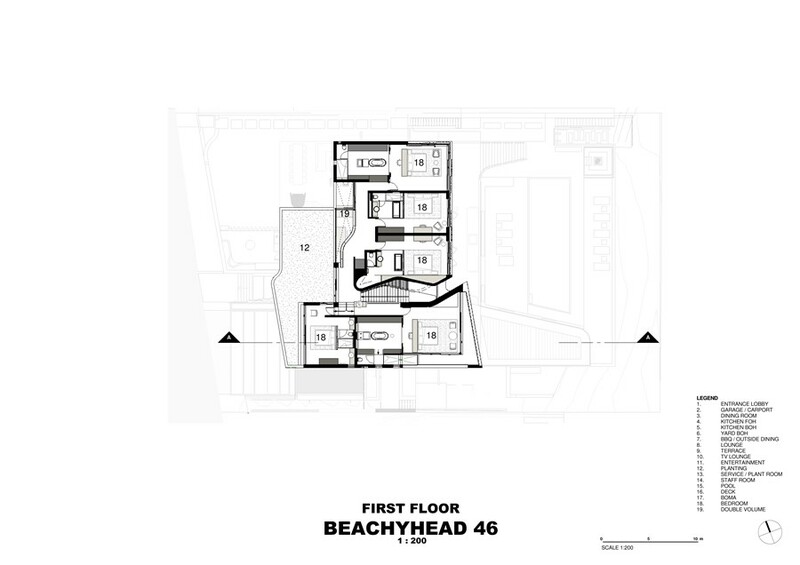 When approaching from the road, the scale of the house is modest and the living spaces concealed on a lower level. Timber shutters provide privacy to the gallery-like bedroom passage above whilst protecting the façade from the afternoon sun. A strong horizontality is articulated in the entrance canopy which is planted with indigenous shrubs cascading over the slab edge. A stone wall introduces the plinth from the lower levels and appears to fall away as one steps down to the front door. The living space is column free with the bedroom wing above supported by a large sculptural fireplace. Oxidised copper, salvaged from discarded hot water cylinders, is woven to line the inner part of the fire place. This allows the colour of the ocean to extend visually into the living room as the primary focal point. The large sliders open past the envelope of the building, permitting unhindered access and views between the wind-protected entertainment courtyard, the living space and the front terrace. The kitchen is practically positioned to serve the living spaces and the Northern courtyard where a pizza oven chimney is a strong vertical element, counter-balancing the horizontal entrance canopy and floating bedroom wing. The kitchen volume opens upwards allowing northern light into the space and connecting to the gallery passage above. The bedrooms are given privacy and protection from the morning light by means of large timber, sliding shutters. The rooms are designed to take maximum advantage of the space available, raised bathrooms open up to the room, allowing views to the ocean from anywhere in the room. Small skylights allow natural light into the bathrooms which otherwise would have been reliant on artificial lighting. Large mirror surfaces at the ends of the rooms further accentuate the space and strategically reflect either Robberg or the Outeniqua mountains depending on the vantage point. The main bedroom is placed on the higher part of the upper level to take advantage of the ocean views. All bedrooms’ en-suite bathrooms and dressing rooms open up to the room and to the ocean views. The stone plinth on the lower level accommodates a games room, large guest suite, audio-visual room and service spaces behind. The pool is located on this lower terrace but remain conveniently connected to the main entertainment spaces by means of a stone staircase, articulated as part of the plinth. The pool is situated centrally to this garden/ deck area to allow the main tanning deck to extend to the end of the site where the afternoon sun can be enjoyed. The water level of the pool is 20mm above the deck surface, a rim flow all round creates the impression that this reflective water body slots into the timber deck. The lowered boma (fire pit) in the far corner of the terrace is protected from the wind by glass panels, this is a more secluded space to sit around an open fire, close to the beach. 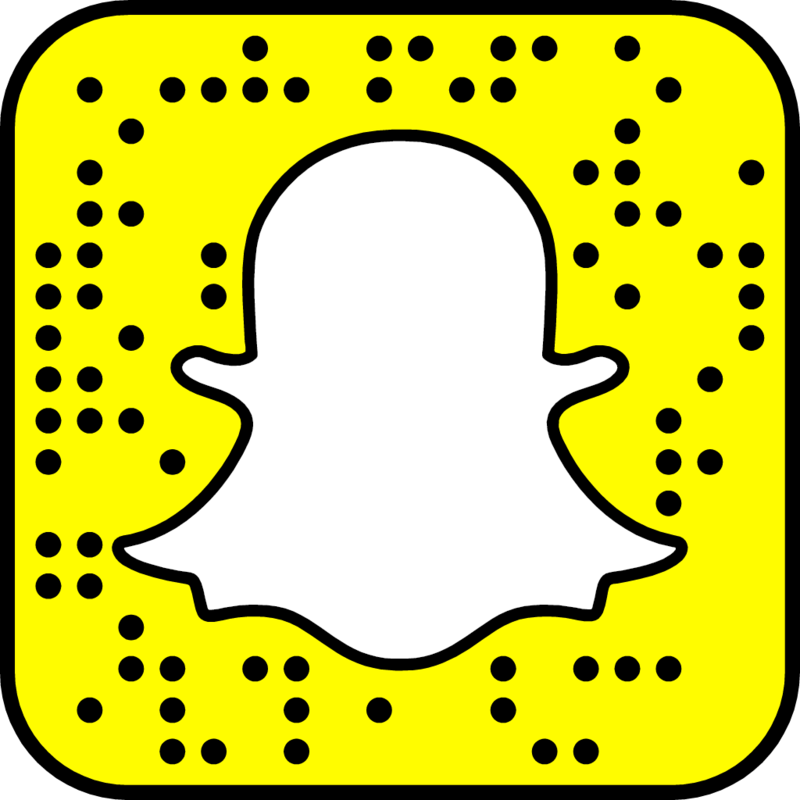 This entry was posted in bathroom, bedroom, house, kitchen, living, outdoor, pool, terrace and tagged bathroom, Beachyhead, bedroom, contemporary house, home, house, house idea, houseidea, idea, kitchen, living, luxury, myhouseidea, outdoor, Plettenberg Bay, pool, saota, South Africa, terrace, villa on July 30, 2016 by admin.